Here is my silver lining. Flash is gone, but she will not be forgotten. Her story will live through me. Her struggle will live through me. And I will renew my life’s focus -- to give every abused animal on this earth a better life -- to honor her memory. A remarkable 32% of the public now believes that animals should have the “same rights as human beings” (higher than the percent who approved of LGBTQ equality 20 years ago). And while there are many reasons for this shift -- from increasing scientific evidence of animal consciousness to the cute animal videos we’ve all shared on facebook -- perhaps the most important one is that the animals are no longer strangers to us. 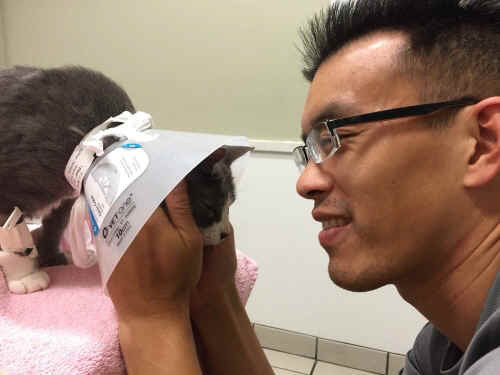 In Nov 2015, Flash was stricken by a mysterious illness. It was the last of many struggles in her 11-year life. About one week after Flash was born in the winter of 2004, her mother disappeared. She might have been run over by a car, or killed by a predator. Flash never knew. All Flash knew was that her mom never came home. Flash and her brothers needed someone to bottle feed them to survive. But Flash’s human hosts took the easier route. They put the three kittens in a box, and left them on the street. There, the humans would not have to hear the kittens’ pitiful, starving cries. Flash’s brothers gave up. Their tiny voices grew quiet, chilled by the freezing Chicago cold. But Flash continued to cry. She cried, and she cried, and she cried. As loudly as her squeaky little voice could cry. She cried because she desperately believed that someone would finally hear her cry. And, miraculously, someone did. They heard little Flash, picked up the box, and brought the three malnourished kittens to the Chicago pound. It was the first, but not the last, time that Flash would save someone’s life. I used to say it proudly. Cats, I believed, were like the cool kids at school -- too elite to talk to a lowly nerd like me. I was the last person on the planet you would expect to nurse three malnourished kittens back to life. Indeed, in two years volunteering every week at the city pound, I don’t think I went into the cat room a single time. “We have three orphans in here,” the director of volunteers said. I walked towards her and looked inside the box. Flash, unlike the other two kittens (who were cowering), was sitting and looking straight up at me, meowing in her squeaky meow. Her eyes were like big blue planets, with the distinctive hue that only kittens have. She never shifted from staring straight into my eyes. 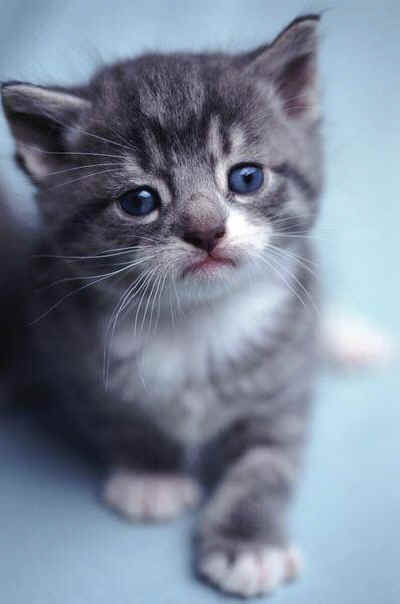 All kittens have a distinctive blue tint in their eyes. The director pulled the kittens out of the box and handed them to me. All three fit on my hand; they were so young they could hardly stand. Flash looked up at me with her soulful eyes and again meowed her squeaky meow. She didn’t leave me much choice. All three kittens had to be saved. I had never raised a cat before, but I ended up fostering 8 cats at once. A pregnant cat, who I later named Annie, had also been abandoned a few days earlier. She had given birth at the pound that morning, and her four kittens were scheduled to be euthanized -- victims of the distemper outbreak. I agreed to take them all. The Chicago pound -- a tiny facility for a sprawling city of 2.5 million -- was not alone in its deadly policy towards “overpopulation.” Over 1.3 million cats are killed in US shelters every year. Every cat that enters the doors of a "shelter" has a greater chance of being killed than adopted. Those who survive don’t have it much better. In the grim, soul-less cages of the typical shelter, the cats often go insane from lack of stimulation. Many will become sick with diseases such as feline leukemia, herpes, or distemper, and few (if any) will ever receive treatment beyond a final deadly needle. The first days were intense. Annie, frightened by her sudden change in environment, and protective of her newborns, attacked everything that moved. Doors, shoes, hands…. even my poor dog Natalie (who I had just rescued a few months ago from another abusive situation).... all were victims of Annie’s claws. Mother cats will sometimes attack other kittens, too, so I had to especially be careful with Flash and her brothers. They were bottle fed in the bathroom. Annie and her kids had the closet. But Flash and her brothers were not doing well. Formula does not have the same protective antibodies as a mother’s milk. They needed maternal care. So, upon the advice of experienced caretakers, I took a chance. I put them all in the same room. Flash, though the smallest of the three, bravely stepped forward. Annie lifted her head and glared suspiciously. But Flash just kept crawling, seeing the other kittens nursing and wanting to join. Annie tilted her head quizzically, and then laid back back down. Flash began to nurse, and her two siblings quickly joined. Three months later, Flash was darting left and right, up and down, with a speed that rivaled the hero with her name. (The average cat can run at 30 mph, faster than Usain Bolt, the world record holder in the 100m dash.) She never ceased to be in my business. She would sit on my keyboard while I tried to type, on my plate while I tried to eat, and even on my lap in the bathroom while I tried to… ahem. In the choice between “Flash” and “Nosy,” the name Flash was my first choice. But it was close. In raising Flash, I began to see for the first time the incredible sophistication -- and individuality -- of a species that I had always neglected as “aloof” and “stupid.” Dogs, after all, could be taught to behave, to talk, and even to do tricks. What I did not realize was that cats are amazing, too, just in a very different way. For example, Flash developed the habit of sitting on my torso while I did crunches. She was always the most curious of the litter, and it must have puzzled her why her human guardian would do such strange repetitive motions. She would sit on my belly button, as I went up and down with crunches, and she would swat or nip at my glasses or my face or my hair each time I rose. Up and down. Up and down. But she would always do so playfully and lovingly... in a way that would leave me unharmed. Though she was the bravest of the kittens when she was little, she also turned out to be the smallest as they all grew. And small cats, like small animals of other species, often end up on the bottom of the pecking order. Flash was pushed around by the other kittens, so she always stayed close to me for protection. What she didn’t realize was how much protection she provided me, too. I was at a breaking point in my life. I had inexplicably left graduate school, was nearly failing out of law school, and felt my life had lost all purpose. (Even the Vegan Society at the University of Chicago, which had burgeoned in years prior, was rapidly falling apart, declining in participation after I had taken on organizing responsibility. “You’re a failure at everything,” I told myself.) I would occasionally go up on tall buildings, and fantasize about throwing myself to my death. Flash, with her relentless companionship, saved me from that fate. She needed me, I thought, and in her need for me I saw my need for myself. I had found a little scarred patch on one of the kitten’s backs. As required by the foster arrangement, I brought him back for treatment. “He has ringworm, a zoonotic disease, and the others are exposed. They’re not allowed to stay with you,” the technician said. “But isn’t the pound still dealing with distemper?” I asked. I had seen dying animals even in the past week. Dutifully, I brought them to the pound. “We’ll do the best we can for them,” the tech said. “You can pick them up later." When I got home and started reading up on ringworm, I was surprised. “Ringworm” is not a worm at all but, rather, a fungal infection. And far from being fatal, it is a minor nuisance. Most afflicted animals face at worst an itchy patch like athlete’s foot. But, to my shock, it was too late. The pound had already “euthanized” one of the kittens and was planning to euthanize them all. “You need to stop right now!” I shouted into the phone. My body shook uncontrollably. I ran out of my apartment and drove straight to the pound. The director of volunteer services met me at the door to the clinic. A shouting match ensued where multiple staff members, volunteers, and even a few members of the public began to gather to see what the commotion was about. I played every card I had. I told them that I was a lawyer (which was not technically true, yet) and that they were in violation of state law. I claimed that the cats had been stolen from me, by fraud, and that I was their rightful owner. I even threatened to call the police. But they would not give me back my cats. So I just barged through the doors and decided to take them myself. And, shockingly, it worked. I left the pound with all seven surviving cats in a tiny crate -- my first open rescue -- as tears streamed down my face. Two more kittens later died. Ironically, while the ringworm was completely benign, the distemper outbreak at the shelter was, in fact, actually deadly. One of my little wards, Stripe, shrieked in pain and vomited blood all over my lap, as I rushed her to the emergency vet two weeks later. She died of distemper within days. Four of the kittens remained. Joanie and Flash, who I adopted along with their mother Annie, and Blackie and Stripey No.2, who were placed in loving families. I once again seriously thought of killing myself, wracked by self-hatred and haunted by Stripe’s cries. I curled up in the fetal position every night. 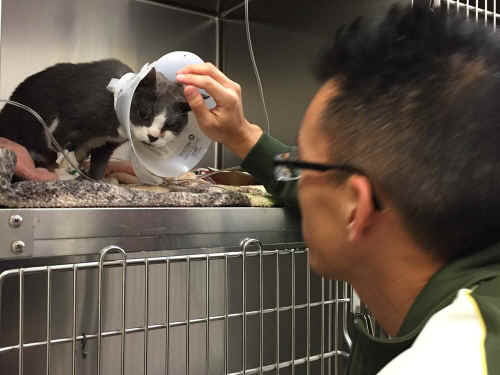 The only thing that saved me was Flash’s playful banter -- nipping, swatting, and licking -- as I went up and down, up and down, convulsing from tears in my bed every night. Eleven years passed. Annie transformed from dutiful and protective mother to a crotchety (but good hearted) old lady. Flash grew up to be small in stature, but big in spirit and in verve. And I adopted another little one, Lisa, a pit bull rescued from a dog fighter, who added more terrifying (but redemptive) stories to the family lore. But one thing stayed the same. Flash and I always depended on one another for support. Even after Lisa ultimately kicked Flash out of the family bed, with the incessant rolling and fidgeting of a young canine, there was rarely a night that would not end with me doing some crunches, and having my littlest one play with my hair, my glasses, my face. “Thank you, Flashie,” I would say before I went to bed every day. Then suddenly, everything came crashing down. One of my roommates noticed first. I was away helping to care for my dying mother, but Flash was not as energetic as she would usually be. She was struggling to climb the cat tree she had climbed for 11 years. A few days later, I was at the vet. I could not believe what I was hearing. Flash was only 11, half the age of many elderly cats. How could she possibly be dying? Flash cried pitifully when I left the hospital every night. I rushed her to the specialist. And over most of a three week period, Flash lived in a tiny cage, under the terrifying lights of a San Leandro animal hospital. She was surrounded by strange sounds, and sights, and smells. She wore a cone, and had catheters, valves, and tubes connected to every part of her body. And a dog with a bloody, stitched up hole in his face, moaning pitifully, was in the crate immediately underneath her. Though my mom was also dying, 100 miles away in Santa Cruz, I made the commute to visit Flash almost every night. But every night, that promise was broken. Her expected date to return home was pushed back. And Flash would cry out, pitifully, as I walked away from her tiny cage. Three weeks after I brought her to the vet, I got a call during a meeting, just an hour before I had been planning to visit Flash for the night. In that moment, I thought of her last days. I thought of the beeps and moans and smells under the harsh hospital lights. The terrifying tubes protruding from her body. The feelings of abandonment she had to endure, night after night, when her papa -- the only parent she ever knew -- abandoned her in a cold steel cage. I thought of this. And it took every ounce of my mental fortitude to stop myself from smashing every object in my sight. Most holiday stories have a happy ending. This one does not. But if there is one thing I have learned, from over 10 years of rescuing animals from the most vile places on this Earth, it is that even tragic stories have a silver lining. From the day Flash was born, the deck was stacked against her. Her human guardians could abandon her on the street with impunity. The shelter that “rescued” her could kill her without consequence. LIke all non-human animals, if she stepped on the wrong tract of land, or into the wrong apartment, the owners would have the legal right to shoot her on sight. And even the hospital built to help her, and animals like her, was a dingy, terrifying, and abusive dungeon compared to hospitals for human beings. The denial of every privilege of life given to human beings is what animal rights activists call “speciesism” -- the systemic organization of our society to oppress a class of beings simply because they are born to a different species. And while the term has little political power beyond the few “animal liberation” activists, a term popularized by Princeton philosopher Peter Singer in a book 40 years ago, it is an idea that is starting to gain resonance. A remarkable 32% of the public now believes that animals should have the “same rights as human beings” (higher than the percent who approved of LGBTQ equality 20 years ago). And while there are many reasons for this shift -- from increasing scientific evidence of animal consciousness to the cute animal videos we’ve all shared on facebook -- perhaps the most important one is that the animals are no longer strangers to us. 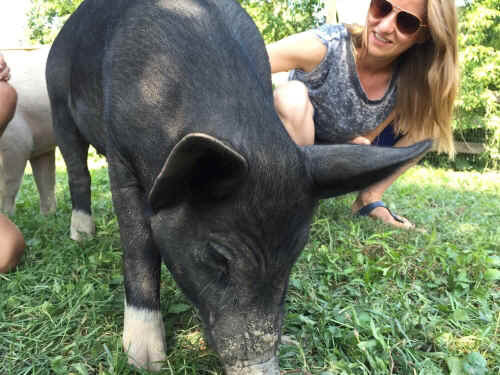 As Farm Sanctuary recently showed Tracey and Jon Stewart, animals -- even those killed for food -- can be our family, our loved ones, our friends. I miss Flash terribly. I hate the way she died. But there are 10 billion Flashies who never even had a chance at life. And if I truly loved Flash -- not just what she provided me but loved her for who she was -- I must love all the other animals of this earth, too. Because in every one of them, I also see Flash. Over the past 10 years, I have been fighting for Flash and her animal brethren. I have climbed through manure pits and pipes and under barbed wire fences, and seen baby pigs so starved and confined that they are eating each other alive. I have dodged police vans and security searchlights, and held innocent little birds whose innards are coming out of their own bodies. And I have rescued a small number of victims, like Sarah (a baby chick left to starve on the floor of a Whole Foods barn), from the horrors that lie beyond the speciesist line. And it is in their stories that I can find -- that we can find -- redemption. Because while the story of animals, in today’s world, is a tragic one, it has a silver lining. And on this holiday season, I will remember Flash by remembering -- and fighting for -- those I could not save.